It is taking South Africans of all ages to realise Tata Madiba’s dream to build a hospital that will secure the lives of African children. The construction of the Nelson Mandela Children’s Hospital is due to start after the breaking of ground during a ceremony held at Wits’ Education Campus in Parktown on Thursday, 20 March 2014. Among the donors who have contributed to the R570 million raised so far for the construction of the hospital are children of varying ages some as young as six years. Sam Harding began donating his pocket money to the Nelson Mandela Children’s Hospital Trust in 2009 as a nine-year-old. His effort led to the birth of the For Kids By Kids campaign, an initiative which has seen the adoption of piggy banks at schools to which all children can contribute for the benefit of children. Seven-year-old Michai’ah Simons is another young ambassador of the hospital. Simons was only two years old when the picture of her sitting on Madiba’s lap was taken at the launch of the Nelson Mandela Children’s Hospital and fundraising campaign in 2009. The picture of her with a laughing Madiba captured the hearts of many. She has since become one of the ambassadors of the hospital contributing to the legacy project. Simons has embraced her role in full and impressed the audience with her speech at the launch which contained a Madiba quote: “It always seems impossible until it is done” and her own personal punch line: “let’s do this”. 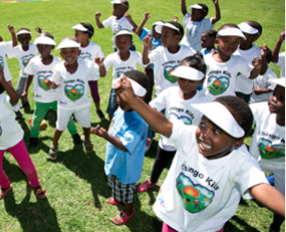 Sibongile Mkhabela, CEO of the Nelson Mandela Children’s Hospital Trust, commended the efforts of young children adding that they are part of the sustainability plan who will see the vision to the future. Wits Professor Keith Bolton, a Paediatrics and Child Health specialist is among the Wits staff who have been instrumental in garnering donor support for the hospital. Mkhabela joked that he may have to wear many hats in the future as a result of his father Christmas-like beard. Outlining the University’s role in the hospital, Wits Vice-Chancellor and Principal, Professor Adam Habib said: “Wits University will ensure that we have various academic and clinical synergies for the operation of the hospital and for the training and education of high level clinical paediatric skills in the Southern African region. Fundraising by the Hospital Trust will continue until the target of R1 billion is reached for building and equipping the hospital, as well as training medical professionals who work within it. 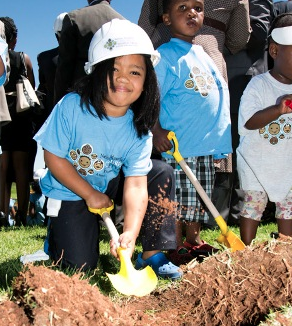 It is envisaged that the Nelson Mandela Children’s Hospital will open in March 2016.